Eye-catching and chic, the Bolero Bar Stool Cream is a superb addition to any kitchen or breakfast bar with its striking original design. Delivering a mix of modern functionality and classic style, the Bolero will become a firm favourite in your home. The seat is built on a wooden frame, with a seat base and backrest finished in a rich walnut, where a round gap draws in your eye, giving further detail and accentuating its curve. 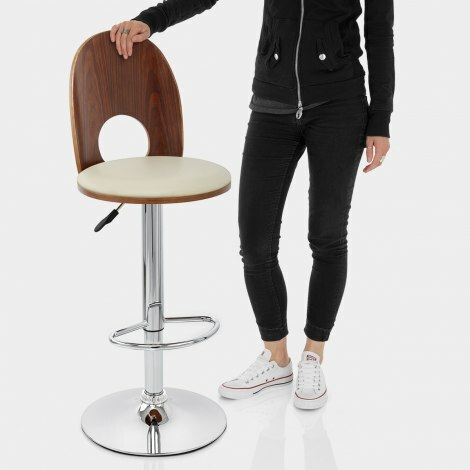 The walnut finish contrasts beautifully with the cream faux leather of the seat, which has dense foam padding for high levels of comfort, and makes the Bolero an arresting sight. Beneath the seat is the chrome plated footrest, and the sturdy base which comes complete with a rubber floor guard. 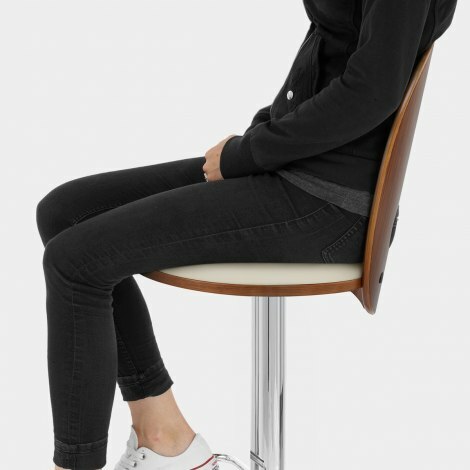 A gas lift mechanism gives variable height and 360 degree rotation, making access to the seat all the easier. "Love the retro style of this stool"
We were very pleased with these. Our delivery came next day as promised. The stools have a smaller footprint than our previous ones (but are suitably stable) and so fit better with our limited space. We particularly like the wooden backs which fit in well with our traditional kitchen - much more so than plastic stools would. They are very easy to assemble. Lovely stools, well finished, easy to set up. Love the retro style of this stool - looks great in my kitchen - and is comfortable to sit on too. It was very easy to put together - especially after watching the video! After ordering it only took a couple of days to arrive and was kept up to date with delivery times throughout - impressed! We were very pleased with the stools. The assembly was very easy. One of the stool seats was damaged but Atlantic were very prompt in dealing with this matter. I would recommend Atlantic for their very professional service and staff.